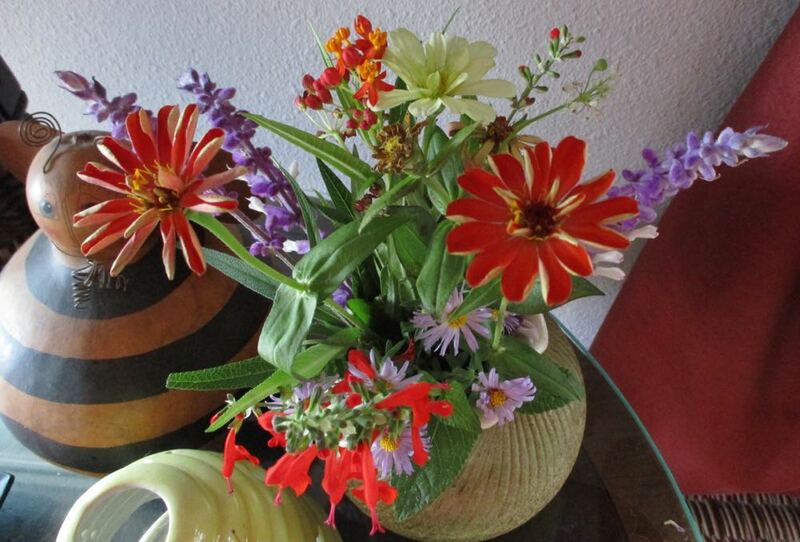 I like to include fresh flowers in most of our beekeeping classes and meetings. It’s a good reminder that bees have a special relationship to plants as nature’s matchmakers and that we wouldn’t have one without the other one. I collect baskets with the same thought. Sometimes a flower vase can be set inside a basket to bring flowers into a room, just as this handmade quilt has Tulips in Basket. In one of our late winter bee club meetings, several attendees were struck by the tiny flower vases holding early daffodils. One said she was looking for something similar for a wedding. 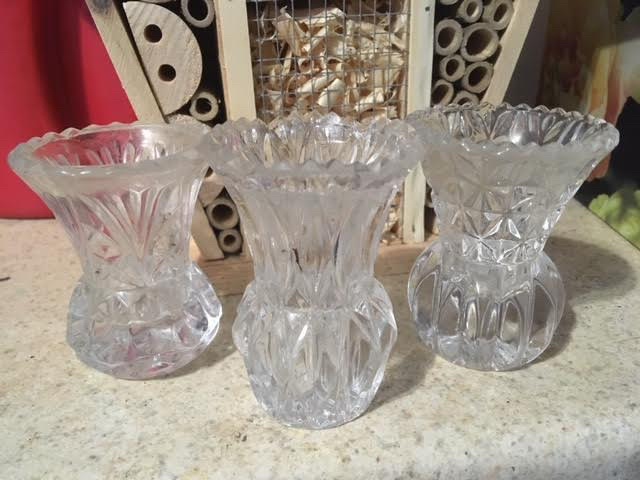 Another said she would love to have some small flower vases to easily scatter fresh flowers around her house, something I can relate to and do. The trick to finding tiny flower vases is to be creative. The “vases” at the meeting started their live as toothpick holders. The reason I like to use them for flowers is they have wider bases to hold water. None of the toothpick holders were the same but they were the same height. Some miniature orchid pots, the ones without holes in the bottom, also work well as tiny flower vases. I once used asparagus cans with their paper removed as flower vases so you are only limited by your imagination. Now can someone pass me a toothpick, please? A friend recently gave me these sweet US wildflower prints. No, they are not cut out of a book, the set was a reprint of flower plates found in US Wildflower books. Not wanting to spend the hundreds of dollars to have them professionally framed, I settled with five $2.99 per sheet of art paper a little darker than the actual prints. A visit to area thrift shops turned up the ten 11x14 inch frames, seven matching and three with thinner frames. They all had some wear along the frames so before adding the prints, I rubbed them with Howard RestorAFinish in Walnut. Counter-intuitive, I know, but over the years I have found using the walnut color on oak, for example, nicely covers nicks and keeps them covered. After they were dry, I cleaned the glass on both sides, cut the art paper to size and added the flower prints. I did think through which ones would look better in the different-sized picture frames. For example, I focused on the narrow edge frames at each corner to make sure the flowers were in the right direction. The frames were hung so that I can read the flower names as I walk by although I recognize some by sight. The calla lilies, for example, are easy to spot in the flower prints without reading the name on the bottom. I also placed the tiger lilies over the wall lamp, which nicely now illuminates the print. Here are all ten prints now lining my basement hallway. Can you see where the third mismatched frame is? Here’s a hint, take a look at the print under the wall sconce. I didn’t have to polish or do anything else to the wooden frames, with Howard RestorA Finish they now look good as new. Now to tackle that gold strip on the wall sconce, maybe I should paint that silver? It’s beginning to look like spring - or at least sound like spring where I live. We had almost a day of thunderstorms followed by a few hours of sunshine punctuated by a serenade of spring peepers, tiny frogs that can make a huge sound. These warmer days are also a welcome sight for beekeepers since temperatures over 50F bring honeybees out of hives in droves. They are not only cleaning house in those warmer sunny days but they are also scouting for pollen. The sight of their packed legs returning to their hives is a sure sign that spring has almost arrived. One of my friends decided she also wants to keep bees as I do but wasn’t sure about having the actual little flying machines in her garden. As a combined birthday and housewarming gift, I sent her a unique, one of a kind Days of the Week Beekeeping Kitchen Towels set . Made in Missouri from brand new muslin towels we make ourselves, each of the 16x32 inch towels are hand embroidered with different beekeeping scenes, one for each day of the week. Just as we have in this gift set, I included a jar of honey from the Bluebird Gardens Apiaries to use in her tea. She was thrilled. She said now she can claim to be a beekeeper and won’t get stung! One of my favorite handmade Santa dolls is on his way to Minnesota. Every handmade Santa doll is unique and the face of this one made me smile every time I saw it so I featured it on our home decor page banner. Most of these Santa dolls are made out of cutter quilts for their suits, giving yet another way to repurpose these pre-loved handmade quilts. Cutter quilts are quilts that now only have pieces that are salvageable so are often cut up into pillows, stuffed animals and, in this case, Santa doll suits. This Santa doll was a little different. He is wearing a burgundy red suit with a few patches, which is how I imagine the real Santa suit would be after all of those chimney visits! To get this Santa doll ready for his box ride, I added a label inside his suit. ﻿All of our unique Santa dolls are shipped with a brand new, collapsible doll stand so they can be placed standing near a Christmas tree. The dolls also easily sit for posing on fireplace mantels, gift packages, doll chairs - and they are most definitely huggable. Just in case something happens to the shipping box, each Santa doll is tucked into a plastic bag only for the trip to their final destination. We recommend you store the Santa dolls as you would lap quilts and regular-sized quilts, in cotton pillow cases or cotton fabric. Plastic doesn’t allow the cotton to breath and can accelerate cotton fiber deterioration. Oops, almost forgot to add the good wishes! A little bubble wrap to keep Santa doll from moving around in the box and off he goes. Not exactly a sleigh with reindeer but it should get him to his final destination nevertheless so that he can continue to make wishes come true! Are you getting excited about decorating for the season? We all have holiday traditions and this hack now is one of mine. This is such a handy little trick for hanging ornaments, it surprised me over the years how many people had not thought of doing this. I was among that group when one holiday past I was in an office after hours decorating for Christmas. I was the visitor so I took up the mundane tasks - removing ornaments from the box, separating the broken ones for repair and/or disposal and lining up the rest for tree hanging. In the middle of this little enterprise we ran out of ornament hangers, those little slight pieces of pre-formed wires that hold an ornament on one end and the tree on the other. One of my associates volunteered to head off to get some when the senior administrative assistant said no need and headed off to the supply closet. Over the years, I have worked in many offices over the holidays to give full-time workers time off with their families. That has given me the opportunity to share this little hack many times. It also works to attach decorations to wreaths and, if the Christmas stockings are not too heavy, once hung stockings from the top of an office cubicle. Do you have a favorite Christmas decorating hack to share? This is as close to holiday decorating in a box as I can make it. A friend moved into her first house earlier this year. She wasn’t sure she would have time to put up any holiday decorations so I thought about how I could help her have a little taste of the holidays. I was going to send her our Happy Holidays Cardinal Lap Quilt then remembered she doesn’t have a lot of room so I came up with this tiny personalized holiday decor gift. I started with a tiny artificial tree, tiny garland and a set of small dog ornaments from our local hobby shop. If you don’t have a hobby shop you can find tiny trees at any big box store. If you can’t find the traditional garland in a small size, the tiny Christmas tree garland can be anything from a small ribbon to a tiny necklace chain. I added a few tiny cookie ornaments from my own tiny tree. The dog ornament at the top has her dog’s name written on the back of the ornament. So that she can finish decorating the tree, four cat ornaments with personalized cat names on the back are in a tiny gift box. I picked up a cute Santa at the fireplace photo frame at a local thrift shop and repainted it with more primary colors. The original frame had a pink Santa Claus, pink Christmas stocking and hard to distinguish books on the mantle top. A little paint to brighten the frame and a personalized photo now makes this fireplace ready to place next to the tiny tree. When I was looking for a gift box, I found the little dog ornament that barks “jingle bells” so I had to add that, even if it is not to scale. Now she can either use this in her home or take it to the office to decorate her desk. Or she can take the singing dog toy to the office and keep the tree and fireplace mantle at home and she will be all set for Christmas! Can you think of anyone on your gift list who could use a tiny holiday decor gift? Does this look familiar, someone sitting on a love seat - well, in this case - sleeping on the love seat and falling through the cushions? Better yet, have you tried to find a love seat with a solid back and cushion so that your sleeping cat doesn’t fall in between the pillows? And maybe you don’t as well?? From what I could gather from my research, all love seats have two bottom cushions and two back pillows, assuming two people will be seating on the furniture. In my household, however, one person tends to sit on the love seat with a cat on either side, leaving the one person to fall into the center opening between the bottom and back cushions. Or, in this case, the cat slowly disappears between the cushions since we all know cats have to sit and sleep in the smack dab middle of everything. One of my cats volunteered to demonstrate, see how the back pillows are spineless and it’s easy to fall through the seat cushions? He really is trying to sleep but his back paws are straddling the moving love seat cushions. I called a local upholstery shop and explained the problem. Maggie said she could easily make a solid bottom cushion and add fill to a solid back cushion as well. Once I settled on the fabric and it was in the shop, it took about a month for the “new” love seat to come back home. What a difference! In terms of cost, it was less expensive to have the piece reupholstered than it would have been to go out and buy a new love seat. Even if I wanted something new, I would not have found one with a solid bottom or back cushion. To make sure we are warm and cozy over winter, I found a matching fake fur sofa cover. Hmmm, doesn’t quite look right. Let me make a few adjustments to show you how this really will be allocated and used! Had to add the Cat Mischief lap quilt, it’s perfect to brighten up the corner. Isn’t it amazing how cats can find the exact center of everything?? Two more of our handmade Santa Claus dolls made out of old patchwork quilts are getting ready to travel East. These unique, one of a kind dolls add charm to any holiday home decor and are squeezable, too. To get the Santa dolls ready to be shipped, their brand new metal doll stands go into the bottom of the box. The doll stands give posing options, including having Santa stand on a mantle or on a side table. These Santa dolls can also be posed sitting. Before going into the box, I add labels to the back of the old quilt doll garment. As I sew on the labels, I imagine Santa in his new home, bringing the holiday spirit. Each Santa Doll gets packed in a clear plastic bag to ensure it gets to its new home safely. In past years I have given these Santa dolls as gifts and since have seen them return year after year as part of the holiday home decor. Yes, Virginia, these dolls do bring the holiday spirit! My little collection of homegrown roses welcoming kitchen visitors. Over the years whenever I was living somewhere besides at home, I had fresh flowers in my room. Usually they were nothing fancy, maybe a sprig of wildflowers growing nearby or a tiny bouquet from a corner florist. When I was working in Japan, one of the embassy staff shared their one weekly chrysanthemum with me. In that country, they appreciate and celebrate the beauty of one flower. Now that I am working from home, one of my priorities continues to be to have fresh flowers nearby. They may be growing in a pot, which is my favorite way to have that touch of greenery in my rooms, or they can be something I cut from my hillside garden. As a cold front moved into Missouri, evening temperatures plunged in the high 40s, cooling daytime temperatures into the delightful 70s. My plants appreciated the reprise from hot and humid conditions and delivered a delightful crop of one of my favorite flowers, roses. The yellow hybrid tea was munched by a couple of insects but it joins the peach hybrid tea with a lovely fragrance. This long-stemmed rose reminded me of the vintage yellow roses quilt I found a few years ago at an estate sale. The two smaller miniature roses made their second garden appearance since spring. I have them tucked away in garden borders to surprise me when they bloom and all I can say, it worked this fall! I suspect these are the last roses of the season, a lovely way to end the gardening year and extend the growing season if just for a few more days. Cats also enjoy reading nooks, especially the napping part of comfortable sunny reading nooks. I have been featuring a number of reading nooks to inspire you to set one - or a few - up in your own living space. Reading nooks are a wonderful way to take a time out, unplug, and reduce stress from our very busy lives. Part of a reading nook includes having a pet. Giving a pet attention has been proven to reduce blood pressure, take our minds off our troubles and reduce stress. For those who need help with taking a nap, also a good thing to do in a reading nook, cats would be handy to have since they are such experts at napping. Place the cat reading nooks in a sunny window. There are few things a cat loves more than looking out the window. Helps if the window has a bird feeder outside to watch. Cat reading nooks in windows is a must, even if no books are nearby. Cat reading nooks, like people reading nooks, can also have greenery. Make sure having nearby plants are not too close or they may be paw-wrestled. Make sure any plant you place nearby behaves itself. I apparently have plants that jump out and require some periodic feline discipline. Reading nooks baskets hold magazines and books and cat reading nooks hold...well, you know. In reading nooks, blankets are handy for naps. In cat reading nooks, cover any favorite reading spots with a blanket to prevent cat hair from collecting. I also have fake fur chair pads that help keep the chair warm. For those cats interested in learning, give them a guide to learn how to read. Each cat will learn at their own pace. Some cats are known to enjoy not only napping but actually learning to read. Shsssh, try to keep interruptions down to a minimum. Well, maybe someone else also wants to learn how to read. This was the charming "teach your cat to read" kit a friend gave me for Christmas. This is reading nook central, where I do most of my writing, research reading and cat petting. I have been featuring a number of reading nook ideas I have around my house to inspire you to set one - or half a dozen - up in your home. Studies show having a quiet space where we can go to relax, read, unplug from our electronic devices and spend time with a pet - is a good way to reduce blood pressure and help us be happier. I know the traditional approach is to show perfectly appointed rooms but that's not reality so here's my quite real, and a bit of a disaster, reading nook in my den off my kitchen. This is also reading nook central, the spot in my house I use the most because it has the largest side tables where I can use my computer to write, and where I can pile the most books when I do my research. I know I said unplug earlier, and I will show you how I learned to do that in a minute. In addition, the two-seater sofa has a bunch of throw pillows. I use some for a head rest, the others to fill in the gaps until I can have the two separate seat cushions merged into one large one. These tiny love sofas are not designed with stereo cats in mind! A breakfast tray works well as a computer stand when I don't want to use the side table. Even so, I still have some of the principles I showed you in other reading nooks, starting with the Four Season's Throw on the sofa back. I like to have quilts and throws close by so I can curl up at the first inclination of a cat nap. This sweet all cotton throw has four panels featuring each of the seasons so I can easily refold it to mark a different time of the year. Right now I have it folded for the winter scene. Four Seasons Throw has four different panels that can easily be featured on the back of the sofa. Instead of a basket to hold books, I use an old wood magazine rack I refinished. Magazines don't sit up well in these contraptions but books do so I keep some of the ones slated for further study close by. If they graduate to the magazine rack they are slated for reading soon. An old wood magazine rack works better to hold books slated for closer study. I also have baskets, only in this reading nook I don't use some of them to hold books and magazines, I keep them on the side to hold items I need to repair. It's like having a little sewing area close by so I don't put off getting the things repaired because they are out of sight. That poor little fabric turtle periodically disappears. I usually find it in another room in the middle of a pile of other cat toys, the victim of being purloined by my yellow cat Shirley Honey who has her own ideas of home decorating. I also shopped for several flat baskets to keep my magazines nearby. Storing them flat prevents them from getting wonky when I tried to keep them standing up in a magazine rack and I can easily retrieve them when I need them. They have also been known to be used as cat napping spots. Flat baskets add nice magazine storage space under my den coffee table. Other simple home decor items have also been re-purposed. An old glass candle holder now holds TV remotes and hand cream. A sweet ladybug candleholder keeps my jump drives and multi-purpose knife handy. The greeting cards I use for book marks sit in this whimsical ceramic napkin holder. I also tucked an address book and some notepads to keep them where I can easily get to them. This ceramic flower vase now holds pens, emery boards and thread snips. Interesting flower vases can easily be repurposed so that you can enjoy seeing the actual vase. This cute frog ceramic flower vase now serves as a pen, emery board and letter opener holder. And last but not least, I have greenery. Studies show having green plants around us helps reduce stress and relax. During summer, I have vases full of cut flowers. In winter, I move blooming plants to the corner of the table, this orchid a dendrobium from Burma that started blooming for the first time for me. Love having fresh growing flowers close, especially when everything outside is gray and gloomy. This dendrobium orchid from Burma is now blooming and sitting on my den coffee table. Greenery can be as simple as a small blooming orchid. In winter, my larger plants are scattered through the house, this is an orange tree. To keep my den reading nook green, I left my large orange tree hanging over the side of the sofa. This was an orange seed someone planted 25 years ago and the tree became too big for their space so they asked if I wanted it. After a little trimming, it's now part of my moving collection, sitting on casters so I can easily move it outside to my deck after the danger of frost is over. Many butterfly caterpillars have been known to munch onthe leaves mid-summer. Do I relax in this space? Yes, the cats make sure I do, even when I try to work. Margaret the white cat is an expert at cat naps and she likes to have company. She has chewed on the computer cord a couple of times to let me know when she sits in my lap, I am to set the skinny gray box aside so that I give her my full attention. She's right, we were not meant to spend all of our days attached to electronics, 10-20 minute naps are an excellent way to unplug and recharge our personal batteries. Reading a book to take a break is a close second but only if the cat approves! This is the reading nook on my front porch, a little sparse now but full of plants in summer. Reading nooks are wonderful ways to invite us to take a break and relax. I have been sharing some of the ones I have set up in my house to inspire you. Reading nooks can also be set up outside, like this one I have on my front porch. This is a very small space in a corner that started simply enough with an old deck chair. Years later, the chair graduated to being a small, two-seater porch swing, the perfect spot to sit in and relax after a long day at work. Studies show that spending just a few minutes outside helps reduce stress and extend one's life over time, why not be comfortable while doing that? This reading nook has a metal basket on the wall and side tables behind the porch swing. As the weather turned cold, I started to drag the nearest throw outside to keep me warm. The beige throw now covers the porch swing and my throw of choice, the ladybug throw, is not heavy enough to keep me warm in single digit temperatures so I have it inside over winter. I like to have a quilt or throw nearby so I can toss it over my legs when I sit there for a few minutes to look over my garden. I found a delightful heavy strawberry-themed cotton throw at a local thrift shop for $4 that is now draped on the back of the porch swing for my winter protection. I love all of the strawberries on it; strawberries are part of our family history. My father's line goes back centuries to Hungary where my predecessors were farmers and, in particular. strawberry farmers. Other basic reading nook concepts are still here, too. Take the idea of a basket. Better than a basket, this metal basket is where I can leave magazines and other reading material. Because it is outside, the metal basket is a better choice for holding reading material. Not only will it keep the papers dry but with the basket secured to the wall, it won't blow away. Or get stolen by Cousin George, the raccoon. I also have two little plant stands behind the porch swing that serve as handy tables. I found the little wooden tray specifically for carrying my tea out to the front porch. My local glass company cut the piece of plastic that provides a continual surface over the two tables. Behind the porch swing I have two tables I can use to hold my warm tea and tray. The black metal stand in the corner is new so I will be working with that later this year. My thought was I could leave some paperbacks there but visiting wildlife may want to read them, too, or take them. Maybe I will keep some plants there, or better yet leave some basic gardening tools so I don't have to go looking for them when I spot something I need to get done in the garden. That's the one challenge of sitting outside, there tends to be something I spot that I just can't wait to do later. This is supposed to be a stress-free zone, I know. Well, have to work on that this year, too! Ceramic bird bath came in one winter and hasn't moved back outside since, good napping spot. One of the first things I do when I set up a reading nook is place the chair in a spot where I can both read and enjoy the view. I love my garden so sitting down to enjoy it, even for a few minutes, is important to me, and relaxing. Studies show one of the things we can do to be happy is unplug from our electronics and take time to relax. Some people have told me they think that means taking an elaborate vacation or pursuing a hobby. Although both of those can help, having a comfortable corner in your house where you can easily settle in and relax is more doable and something you can quickly use. In my house, most of my chairs in my living room are facing towards windows, each one a small reading nook. The side table has space for books underneath, and baskets on the low tables by the windows are perfect places to put reading material. Or cats. Pets, such as dogs and cats, help us reduce stress so spending a few quiet minutes in a chair petting a pet is a good way to take a break and contribute to our health. More cats use those baskets than I do; the baskets are a perfect place to sit and bird watch. Garden view out of the front living room windows include a perfect bird watching spot. This chair can easily be turned around when needed. Behind the chair is by my sofa, also a bit of a reading nook with a full book case nearby. A vintage log cabin quilt is draped over the back of the sofa, a bit of color that helps pull all the other colors together in the room. It also comes in very handy when I decide a little cat nap is in order. Cat naps of 10-15 minutes have been proven to be very healthy and helpful to recharge batteries in the middle of the day. The sofa behind the chair also has a small white bookcase with a selection of favorite books. The throw pillows also pull the main room colors onto the sofa although it's all a bit eclectic. I'm not aspiring for high fashion, comfort is more my priority. 1. Comfortable seating, either a chair or sofa. I scrounge for foot stools at thrift stores and antique shops and have a group that gets re-upholstered this year. Maybe. I match up the foot stools with complimentary chairs so at least they look like they should be together until I update one or the other. 2. A handmade quilt or throw draped over the back or side for easy access will keep you easily warm and toasty, especially when time is pressing and you still want that little cat nap. 3. Side table with help aids, such as a coaster and reading glasses. In this reading nook the little yellow ceramic peach can hide a few chocolates. 4. Fluffy soft throw pillows for placing behind one's back. 5. A small white bookcase fills in for a side table next to the sofa. 6. Natural lighting and/or good reading lamps. Make sure the lamps have enough light so that you don't get eye strain. 7. Books and magazines. Yes, a Kindle is also ok as long as you stay away from checking emails and surfing, the idea is to unplug for a few! 8. Note card or something you can use for bookmarks. I like to use thank you cards, that way I get to re-read them every time I tuck them into my stopping spot. I have several tucked into the corner shelf in the book shelf. 9. A cat or dog for company. In winter, I also like having a fireplace going to keep the chill off the room. The fireplace, and baskets, tends to attract the cats so I also have towels that blend in with the chairs to pick up cat hair. 10. Research shows one of the healthiest things we can do is unplug so put the electronics on the "do not disturb" setting and take a break. And now for the ceramic bird bath, not your usual living room item, I grant you, nor a requirement for a reading nook. I brought it in one fall to keep it from cracking over winter and one of my cats found a great use for it. Bartholomew likes to curl up in the bird bath for naps and intense bird watching. Bartholomew likes to nap in the bird bath in summer, too, I can easily reach him from the chair to give him a full body massage so the bird bath has stayed inside. Inspired to set up reading nooks in your home or do you have some already? How about an inside bird bath? BEFORE: One of my most-used reading nooks is beside my bed and a bit of a mess! So here's my most used reading nook at bedside, a bit of a mess thanks in part to cats that walk over, knock books down and I have to place them back on the table as I walk into the bathroom. Yes, it's a daily occurrence so the book pile just kept growing. The bedside table is an old walnut cabinet from my mother that didn't have its original doors. I love having that open space to store books and magazines so re-think furniture pieces for book storage. The open space allows me to keep some basics handy. I keep a dictionary, phone books as well as other material I want to read before sleeping. I may add a little shelf at the top this year to add storage space for the electronics. This old doorless cabinet is perfect as a reading nook side table, offers space for holding books. After some re-organizing, here is the same bedside reading nook cleaned up and ready to welcome the new year. AFTER: Reading nook cleaned up and ready for the new year and new books. I still have a basket only this one is hanging from the wall and holds hand cream, notepads and pens, remote controls and other electronics. I moved the wall hangings around so the books standing up don't cover the wall art. The smaller photo is one of Margaret, my 19-year old cat on the right of the photo, napping with her buddy Bob on the bed. Two metal bookends hold the books I am currently reading. I will be looking for something prettier to cover the metal book ends but these work well enough for now. This makes it harder for Margaret to knock the books over as she walks across the bedside table. Reading glasses, a card for a book mark and "Bun Bun" the cat toy that often gets moves. A thank you note serves as an extra book mark for a new book I may start that doesn't already have a card in it to mark where I left off reading. I will add a few more cards to have them handy. Reading glasses are a must especially for late night reading when my eyes are tired. The tiny fabric rabbit is a favorite cat toy that often gets moved around the house. Shirley Honey is my girly girl cat, she enjoys her own form of decorating by leaving cat toys in different rooms and one doesn't move them without her supervising. I found "Bun bun" in the basket with the hand creams and remote controls and I know I didn't leave it there. Shirley Honey will find it soon enough and move it to a new resting place. I have my Kindle here, only I keep it with the books instead of taking up space on the table top. When it's warmer, the cabinet will get a little hydration with Howard Feed 'n Wax furniture polish and the clean up will be complete. Well, except for Bun Bun, the toy rabbit. I will still be finding that cat toy making the rounds! One of the reading nooks in my living room bay window, the photo shoot interrupted a cat nap. It's a new year and I'm starting by making sure all of my reading nooks are well-stocked and ready for use. Over the years I have dreamed of the day when I could stay home during a winter storm without having to go anywhere. The dream included having comfortable reading nooks where I could stay warm and read undisturbed. Since my house has the "vibe" of a summer retreat, having reading nooks at almost every turn is not a surprise. So what does one need to set up a reading nook? 1. Comfortable chair and complimentary foot stool. I scrounge for foot stools at thrift stores and antique shops and have a group that gets re-upholstered this year. I think that officially counts as a resolution, don't you? In case I can't get to that quickly, I match up the stools with complimentary chairs so at least they look like they should be together. 2. A handmade quilt or throw draped over the back or side for easy access. I suppose that's how those smaller handmade quilts got their common name as a "throw" as in "throw over a chair, a sofa..." Looks like I missed changing Santa Friends throw out for something more wintery and snowy. 3. Side table with help aids, such as a coaster and notepad/pen for making notes. I also leave a pair of inexpensive reading glasses, I have enough of those that I can almost leave one at every nook! Shirley Honey seems to be checking my reading options in this basket. 5. Baskets. I have them all over, some holding plants, others next to chairs to hold books and magazines. Place the books edge up so you can easily select a book to read. 8. Note card or something you can use for bookmarks. I like to use thank you cards, that way I get to re-read them every time I tuck them into my stopping spot. Uh-oh, Shirley Honey is giving me that "look" that says why is there something in my basket?? Never fear, Shirley Honey, there's another empty basket nearby for your comfy napping spot. 10. Did you notice I didn't mention a cell phone or Ipad? Research shows one of the healthiest things we can do is unplug so put the electronics on the "do not disturb" setting and take a break. Plants fill bay window nook behind the chair, which I sometimes turn around to enjoy the view. As look around my house, most of my nooks also include a live plant or plants, a nice addition against the snow-covered landscape outside. For the books, I go to two local library sales and save a pile of books for reading in the middle of winter. Sometimes they are several gardening books, other times its a mixture of garden-related books and favorite mysteries or something interesting I have always wanted to read. The "rule" is the books have to be saved for a snowy, wintery day so no peeking! Even if you can't stop and read at that exact moment, a reading nook should at least beckon you to think about stopping what you are doing and curling up in the spot to read. Or look out the window and enjoy the view. What are your must haves for your reading nooks? Love the way these patchwork leaves look like they are falling, don't you? This time of year in Missouri, it's hard to find green leaves. Most trees have turned color so their fall leaves a range of yellow, peach, red and brown with only a dash of green cedars tossed in for contrast. This table runner reminded me of the fall leaves quilt we have, only the leaves in the table runner have a wonderful shadowing effect that suggests the fall. This is a basic patchwork leaf pattern without the shadow effect. Green Leaves Quilted Table Runner would be nice to have as a reminder that green colors will soon be back. Well, maybe not so soon, it will be next spring but I have enough plants inside over winter to keep my environment green until the outside "greens up" as well. 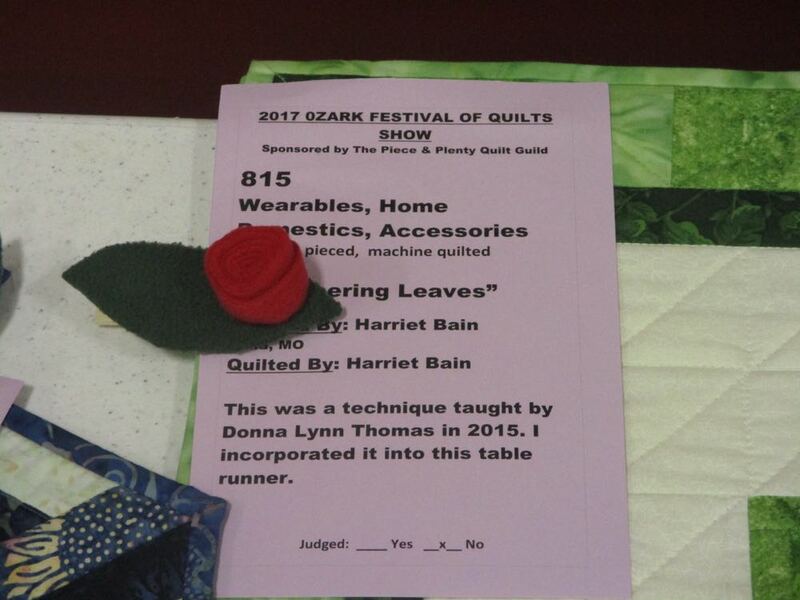 The quilted table runner was entered in the 2017 Piece and Plenty Quilt Guild Show held October 7-8, 2017 in Rolla, Missouri. The quilt show is held every other year. Making table runners is a good way to practice new quilting techniques. When I first learned to quilt, we use to make our practice quilt blocks into pot holders, throw pillows and even skirt pockets. These days, table runners are a popular home decor item to make, especially by beginning quilters. They use up only a few blocks and give the quilter experience working the patterns before they tackle a larger project like a throw or full-size bed quilt. 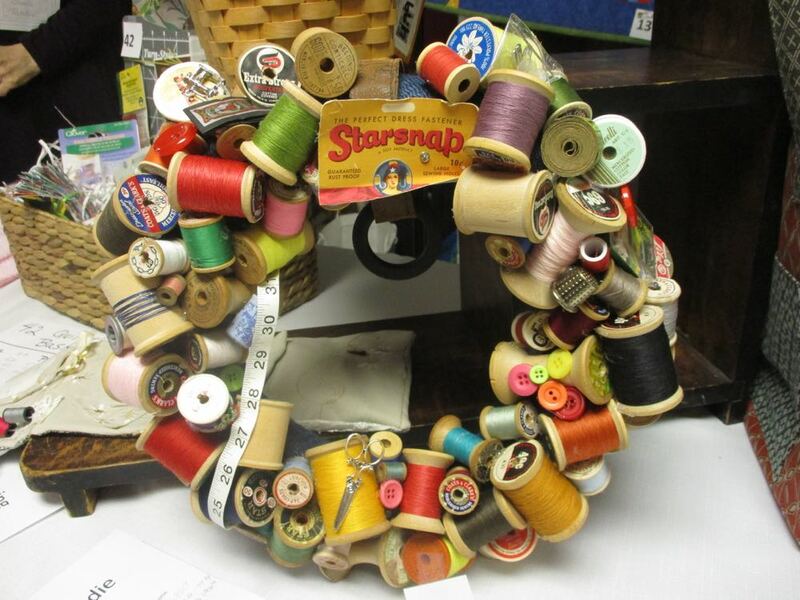 Vintage sewing thread spools wreath up for auction at a recent quilt guild annual show. I love wreaths. Like quilted wall hangings, they are an easy way to update home decor with little effort so I keep favorite seasonal ones hanging inside one of my hallway closets. I'm pretty picky about my wreaths. They have to be unusual, and personal. Doesn't matter if they represent something that only I understand. After all, it's my home so I should be able to look at them and smile. I was walking through a recent bi-annual local quilt guild show when I spotted this vintage sewing threads wreath on the silent auction table. I have an old hat box full of my mother's old sewing threads. Many are too delicate now to thread through my sewing machine but I don't have the heart to donate them or worse, toss them. This charming thread spool wreath spoke to me. Between the different thread spools, old buttons, thimbles, worn fabric measuring tape and little embroidery scissors, it reminded me so much of my mother and spending rainy afternoons sewing with her in our old barn house kitchen. Later this year I may take a stab and making one of these. In the meantime, isn't this a sweet handmade gift idea for a sewing and quilting room? Colder weather is starting to move in so I picked a fall bouquet featuring my blooming zinnias. We've had a fall drought this year, more than a month without rain and record hot temperatures so flowers have been few and far between. I planted my zinnia seeds late this year so when the first flowers started to unfurl, I decided it was time to pick my first fall flowers bouquet. This time of year, it's hard to say how many more bouquets I will get before frost nips what is still blooming. Of all of the seasons, fall is the one when my bouquets are a mixed collection of flowers. Blooming mums aside, I may only have a couple of one flower still blooming so the fall bouquets end up being an interesting mix. Zinnias make wonderful cut flowers, they can be cut still unfolding and will last a long time. This fall bouquet has fall asters, red salvia, a couple of garlic chives still blooming - those are the little white flowers - butterfly weed and the Mexican sage, the long purple flowers. In the center, several zinnias, some picked still in bud form. These should last a good couple of weeks if cats don't decide to munch on the green leaves. Going out into the garden and picking a bouquet of flowers is one of my guilty pleasures. I do it when I am finished cleaning house; when I need a hint of beauty in a difficult day, when I just need a break. I am hoping there is at least one more bouquet to be picked before cold weather settles in. Although I am looking forward to slowing down, I will miss having the fresh flowers to enjoy.